John C. Dennison was born in Oksenvad Denmark on May 29 1858 as Johannes Christian Dinnesen. His wife was Annie K. Dennison. Annie's maiden name is Ane Cathrine Petersen. Johannes and Ane Cathrine Petersen were married in Vejle on November 5 1881. Overview: Ane Cathrine Petersen's ancestors. Clipping from Vejle parish register 1865-1891, page 147. Click on the image to see larger version. The entry in the parish register has the following information about the bride: 'Maiden Ane Cathrine Petersen, 23 years, in service of pharmacist Friis in Vejle, baptized on February 27 1859, confirmed on October 20 1872 in Kolding Church. The consent of her father received on October 17 1881'. Ane Cathrine and her parents are registered as follow in the 1860 census. The names of Ane Cathrine's parents are Jens Peter Petersen and Josephine Petersen. Jens Peter is a blacksmith 30 years of age, born in Kolding around 1830. Josephine is 31 and born in the parish of Bedsted around 1829. Jens Peter Petersen and Josephine Petersen are married in Kolding on June 24 1854. [Kolding Sankt Nikolaj 1823-1854, page 339] The maiden name of the bride is Josephine Buch. Let us first look at the ancestors of Ane Cathrine's father Jens Peter Petersen. Ancestors of Ane Cathrine's father Jens Peter Petersen. Jens Peter Petersen is born on July 17 1830 and baptized on August 1 the same year. [Kolding Sankt Nikolaj 1823-1854, page 28] The names of his parants are Peder Nielsen and Ane Cathrine Larsdatter, the first two of Ane Cathrine Petersen's four grandparents. Jens Peter and his family are registered as follows in the 1834 census. Earlier in Nordic countries, children had a last name based on their father's first name. A son of Peder Nielsen was a 'Pedersen', i.e. son of Peder. A daughter was a 'Pedersdatter', i.e. daughter of Peder. This began to change at the beginning of the 1800's and it gradually became more common that children had the same last name as their father. 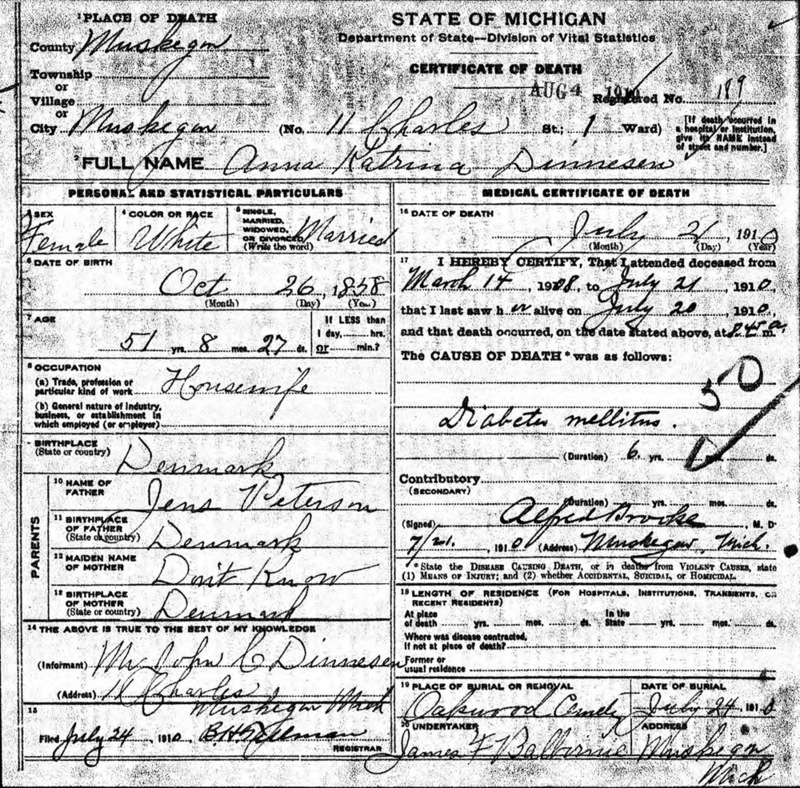 According to the census registration above all of Peder Nielsen's children have the same last name as their father, Nielsen. The person who carried out the census must have assumed that Peder Nielsen and Ane Cathrine Larsdatter had adopted the new naming convention, but this was not the case. As we have seen above, their son Jens Peter has the name Jens Peter Petersen written into the parish rigister. From the census of 1845 the data about each individual also includes the place of birth. Peder Nielsen in 1845 is a merchant in Kolding, born around 1790 in a place named 'Stouen' in 'Alle?' parish. After checking some maps I am able to identify the birth place as the village of Stubbom in Aller parish 15 kilometers south of Kolding. Ane Cathrine Larsdatter is born around 1795 in Laeborg parish 20 kilometers west of Kolding. Ancestors of Ane Cathrine's grandfather Peder Nielsen. The Aller parish register confirms the above assumption. Peder Nielsen is born on November 9 1793. His parents are Niels Jepsen and Anna Pedersdatter of Stobbum. [Aller 1784-1799, page 42] Niels and Anna are the first two of Ane Cathrine Petersens's 8 great grandparents. Niels Jepsen and Anna Pedersdatter are married in Aller on January 25 1788. This entry in the Aller parish register of 1788 thus gives us the the names of the first 4 of Ane Cathrine Petersen's 16 great great grandparents: Jep Hansen and Maren Marcusdatter of Eltang - and Peder Jensen and Maren Pedersdatter of Stobbum. Peder Nielsen and his father Niels Jepsen are registered in the 1803 census. Niels Jepsen in 1803 is a tailor, 40 years old and widower. His wife Anna Pedersdatter dies earlier in 1803 and is registered in the parish register as 43 years old and born in 1760. Grandfather Peder Nielsen's parents Anna Pedersdatter and Niels Jepsen. Peder Jensen and Maren Pederdatter are the first two of Ane Cathrine Petersen's 16 great great grandparents. Both are born in Aller parish. Peder Jensen is born in 1728 [Aller 1714-1764, page 29] and lives until 1793. Maren Pedersdatter is born in 1721 [Aller 1714-1764, page 15] and lives until 1781. Peder and Maren get married in Aller church around 1755. Mariages are not listed in the parish register before 1763. Peder Nielsen's father Niels Jepsen is registered in the 1803 census as 40 years old, meaning he is born around 1763. According to the registration when Niels Jepsen marries Anna Pedersdatter in Aller on January 25 1788, Niels is the son of 'deceased Jep Hansen and Maren Marcusdatter of Coldinghuus, of Eltang'. I have searched the Eltang parish register for any records of Niels Jepsen's parents Jep Hansen and Maren Marcusdatter but without any luck. The birth of Niels around 1763 is not seen in the register and I have not found any of his parents in the funeral records of Eltang parish. Also, Jep Hansen or Maren Marcusdatter are not found in the 1787 census. In all likelyhood, therefore, both have died before 1787, possibly in Eltang parish - where the funeral records are very weak and quite unreadable before 1780. In any case, Jep Hansen and Maren Marcusdatter are the second two of Ane Cathrine Petersen's 16 great great grandparents. Ancestors of Ane Cathrine Petersen's grandmother Ane Cathrine Elisabeth Larsdatter. As we have seen above, Ane Cathrine Petersen's grandparents on her father's side are Peder Nielsen born 1793 and Ane Cathrine Larsdatter born 1798. Our Ane Cathrine Petersen is named after her grandmother Ane Cathrine Larsdatter. From the 1845 census we know that Ane Cathrine Larsdatter is born in Laeborg parish around 1795. Laeborg village is around 20 kilometers west of Kolding. Grandfather Ane Cathrine Larsdatter's parents Lass Nielsen and Stine Hansdatter. Ane Cathrine and her family are registered in the 1801 census as follows. Lass Nielsen is a day-laborer without land. His wife Stine Hansdatter is a weaver. Ane Cathrine born 1898 is their 3rd child. Lass Nielsen born around 1757 and Stine Hansdatter born around 1772 are the second two of Ane Cathrine Petersen's 8 great grandparents. Lass Nielsen of Vejen and Stine Hansdatter of Andst are married in Andst on April 24 1793. [Andst 1766-1793, page 36] Andst is a neigbouring parish to Laeborg around 15 kilometers west of Kolding. Stine Hansdatter and her family are registered in the 1787 census as follows. When Lass Nielsen and Stine Hansdatter are married in 1793 the parish register says Lass is 'of Vejen'. According to the 1801 census - where he is 44 - Lass is born around 1757. I have checked the Vejen parish register but I have not found the birth registration of Lass Nielsen, i.e. we do not have any information about his parents. Ancestors of Ane Cathrine's mother Josephine Buch. As we have seen above, our Ane Cathrine Petersen and her parents are registered as follow in the 1860 census. The names of Ane Cathrine's parents are Jens Peter Petersen and Josephine Petersen. Jens Peter is a blacksmith 30 years of age, born in Kolding around 1830. Josephine is 31 and born in the parish of Bedsted around 1829. Bedsted is located in Southern Jutland around 25 kilometers west of Aabenraa. Let us now look at the ancestors of Ane Cathrine's mother Josephine Petersen, maiden name Josephine Buch. We do not know therefore the full name of Josephine Petersen's father, nor do we have any information about his background. What we do know is that some years after the birth of Josephine, Josephine's mother Kirsten Marie Pedersen marries a Christian Buch and settles with him in Ødis parish around 10 kliometers southwest of Kolding. Christian Buch is Josephine's stepfather and Josephine's full name is now Josephine Buch. Christian Buch is a day-laborer in the village of Oedis. He dies at age 62 in 1847 - and Kirsten Marie Pedersen at age 48 in 1851. [Ødis 1846-1860, page 262] In the parish register Kirsten Marie Buch is listed as a widow and a pauper - and it is mentioned that her parents are Hans Pedersen and Anna Pedersdatter of Bedsted and that Kirsten Marie leaves behind two children from her marriage with Christian Buch, Christen Hansen and Hans Peter Buch, and a daughter born outside of the marriage, Josephine aged 22. Kirsten Marie Petersen and Christian Buch are the last two of Ane Cathrine Petersen's 4 grandparents. Ancestors of Ane Cathrine Petersen's grandmother Kirsten Marie Pedersen. Hans Pedersen and Anna Pedersdatter are the last two of Ane Cathrine Petersen's 8 great grandparents. Hans Pedersen and Anna Pedersdatter are married in Bedsted on May 21 1803. [Bedsted 1762-1857, page 188] The parish register generously gives us the names of the parents of both groom and bride. Hans Pedersen is a son of Peder Hansen and Mette Andersdatter, both are deceased, and Anna Pedersdatter is a daughter of Peder Lydichsen Pedersen and Kirsten Hansdatter of Bedsted. Peder Hansen 1741-1788 and Mette Andersdatter 1747-1800 are the fourth two of Ane Cathrine Petersen's 16 great great granparents. The jsja.dk website also has more information about Anna Pedersdatter's parents. Peder Jessen Lydiksen is born in 1750 and is a day-laborer in Bedsted. [jsja.dk] Kirsten Hansdatter is born in 1747. [jsja.dk ]Peder Lydiksen og Kirsten Hansdatter are married in Bedsted on May 9 1779. Our ancestor Anna Pedersdatter born in January 1780 is the first child of this marriage. Peder Jessen Lydiksen born 1750 and Kirsten Hansdatter born 1747 are the fifth two of Ane Cathrine Petersen's 16 great great grandparents. The website by Jørgen Steen Rasmussen shows that Jørgen is a descendant from a younger sister of our ancestor Ane Cathrine Petersen born 1858. The name of the younger sister is Emma Magdalene Petersen born in 1869. This concludes our little research regarding the ancestors of Ane Cathrine Petersen born in Kolding Denmark in 1858. We have found her parents, her grandparents and her great grandparents. Before her parents - who lived in the town of Kolding - all of Ane Cathrine's ancestors come from smaller villages in the southern part of Jutland. We have found 6 of her 8 great grandparents and 10 of her 16 great great grandparents. Some are smallholders or day-laborers, some are tailors or weavers. All are regular people. On Ane Cathrine's father's side the family has strong roots in Aller parish south of Kolding. Similarly on her mother's side the family has strong roots in Bedsted parish west of Aabenraa. Both of these areas as well as the home parish (Oksenvad) of Ane Cathrine's husband Johannes Dinnesen came under German rule (until 1918) after Denmark lost the war against Prussia in 1864. This may have had some influence on the decision of Johannes and Ane Cathrine to emigrate in 1887. They did not have much to lose. Things could only get better. After Johannes Dinnesen and Ane Cathrine Petersen are married on November 5 1881 they settle in the town of Vejle on the east coast of Jutland. Johannes is a carpenter and Ane Cathrine is a housewife. The first child is the daughter Hulda Dorthea Josephine Dinnesen who is born on March 18 1882. [Vejle 1881-1891, page 155] Hulda's name is interesting. With ‘Dorthea’ and ‘Josephine’ she is named after her grandmothers on both her father’s and her mother’s side, i.e. Dorthea Joergensdatter and Josephine Petersen. Present among the witnesses when Hulda is christened in the church are both of Johannes Christian Dinnesen’s brothers, Peter Dinnesen and Joergen Dinnesen. The second child is the son Holger who is born on December 20 1883 [Vejle 1881-1891, page 35]. The third child of Ane Cathrine and Johannes is born in Vejle on June 22 1886. His name is Jens Peter Laurits Dinnesen. He is named after Ane Cathrine’s father Jens Peter Petersen and John’s father Lars Dinnesen. [Vejle 1881-1891, page 66]. All three children are onboard the ship Australia with Johannes and Ane Cathrine when they emigrate to the US in 1887. Clipping from the German passenger list when the ship Australia departs from Hamburg i 1887. Click on the picture to see a larger version. The youngest son Laurits dies as a 6 year old in 1892. His name is reused for the next son Laurits / Lawrence born in 1893. The name is important because it refers to John C.’s father Lars Dinnesen. The daughter Hulda is not mentioned in the census. She is 18 at this time and has probably left home. Two years later Hulda marries Richard E. Patterson. 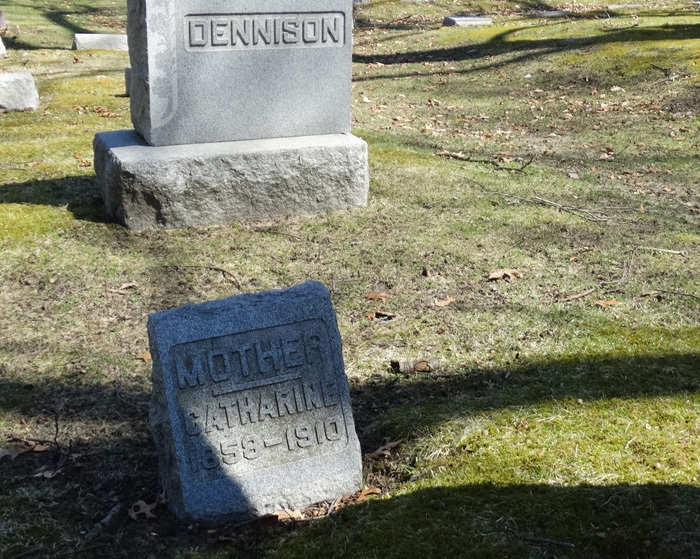 Ane Cathrine Petersen aka Annie K. Dennison dies at the age of 51 of 'diabetes mellitus' in 1910 and is buried on July 24 at Oakwood Cemetery in Muskegon Michegan. and John C. are listed with the original family name Dinnesen, not Dennison.